Recent studies make it increasingly clear that the globe is poised to blow past the 2°C “guardrail” that climate scientists and Parties to the UNFCCC have identified as critical to avoid dangerous climatic impacts, with current projections of temperature increases of 3-4°C or more by the end of the century. Such sobering scenarios have intensified interest in climate geoengineering options, including one focused on in the IPCC’s Fifth Assessment Report’s discussion of geoengineering, bioenergy with carbon capture and storage (BECCS). 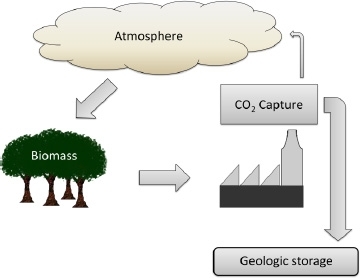 Bioenergy with carbon capture and storage (BECCS). BECCS, which combines bio-energy production (biomass fuel-power stations, pulp mills and bio-fuel plants) with carbon capture and storage technology, has the potential to generate “negative emissions” that could help society avoid exceeding critical thresholds in this century and beyond. It is generally placed under the rubric of climate geoengineering strategies termed “carbon dioxide removal” options, in contrast to strategies that seek to reduce incoming solar radiation to reduce total radiative forcing. The IPCC’s AR5 Working Group 3 assessed over 1000 emission pathways to 2100, concluding that most scenarios leading to atmospheric concentration levels of CO2eq of 430-480 (101 of 116) require global net negative emissions in the second half of the century, as well as approximately a third of the scenarios leading to atmospheric CO2eq concentration levels of 480-7200 ppm in 2100. In a new study published in the journal Nature Climate Change, Sabine Fuss, et al. assess the potential and challenges facing large-scale deployment of BECCS. It would be an excellent student reading for a climate geoengineering module at either the undergraduate or grade level. Negative emissions strategies could help facilitate responses by countries that might not choose to engage in emissions mitigation. If, as the article suggests, that there may be tradeoffs between BECCS and other land uses, including for food production, how should a regulatory regime determine the optimal mix of these tradeoffs, and how does one involve the relevant stakeholders? Given the imposing costs associated with BECCS, how would society establish an adequate price signal to incentivize deployment? Are there scenarios under which it would make sense to deploy CDR and SRM strategies simultaneously or in sequence?